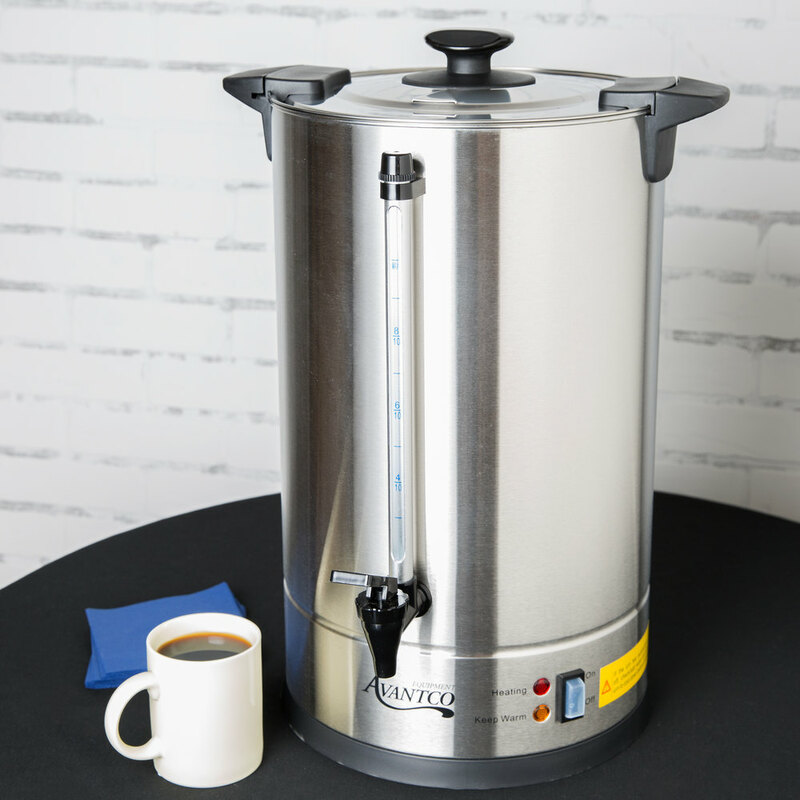 Brew delicious, flavorful coffee day after day with the Avantco CU110ETL 110 cup coffee machine urn is perfect for caterers, schools, churches, offices, and more! This durable coffee machine urn is easy to use, with a heating light to show when it's in brewing mode and a warming light to show that it is in warming/holding mode, which keeps coffee hot and fresh for hours. And because the handles are made of plastic, they'll stay cool even when the urn is hot. A maximum fill line inside helps prevent overfilling, and a convenient sight line shows how much coffee is left. 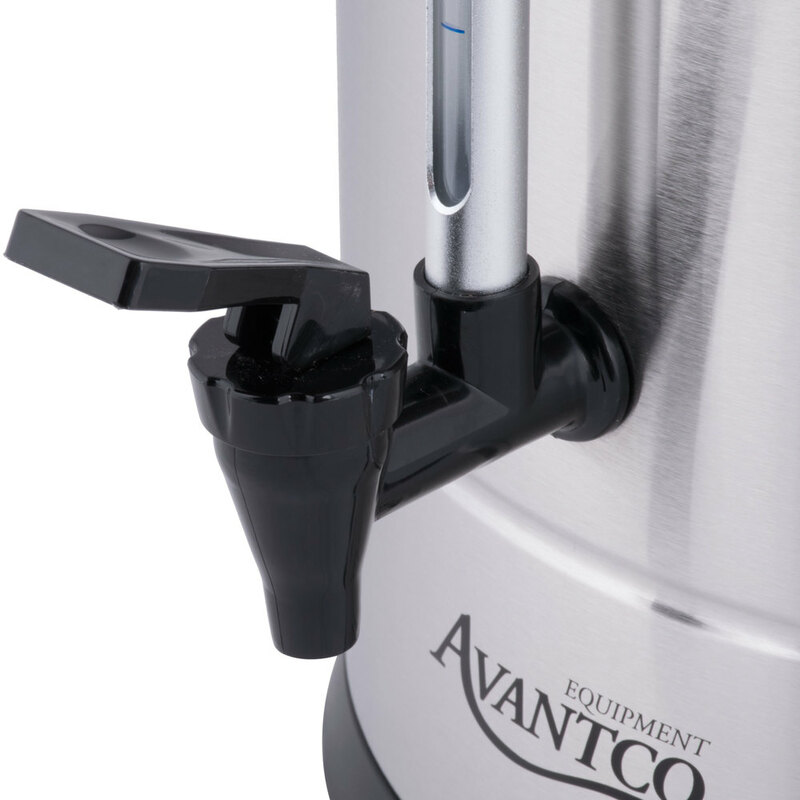 The Avantco CU110ETL coffee machine urn is made of sturdy cool-touch double wall stainless steel with a locking lid feature for safety and an auto-shutoff switch to prevent overheating. Brews approximately 1 cup per minute. This urn has worked great in our church hall for parties, luncheons, etc. We use Webstaurant for supplies for our annual bazaar and our church hall and have never been disappointed. I bought two of these urns for my wedding. Very easy to use and worked excellently. When i ordered them one of them came in dented but customer service was fantastic and helped me fix the issue right away. The coffee maker has been used to preparation Coffe for the shop almost every single day. We have promotions frequently in which customers buy certain amount of money in pastries and they receive a small cup of Coffe as incentive. Coffee Urn is a great product for reception and other events. It keeps the coffee perfectly hot for several hours. The customers who used them were satisfied. We ordered 5 of these. Be careful 1 of the 5 came in a we had to do a reset switch. It has worked perfect ever since. Gorgeous, professional coffee urn. Keeps coffee nice and hot with viewing window to check coffee level. Very sleek looking so you can put it right out with your main catering display. I bought a smaller coffee urn and it just wasn't big enough. So I bought this one and it was perfect for a women's retreat that I catered. 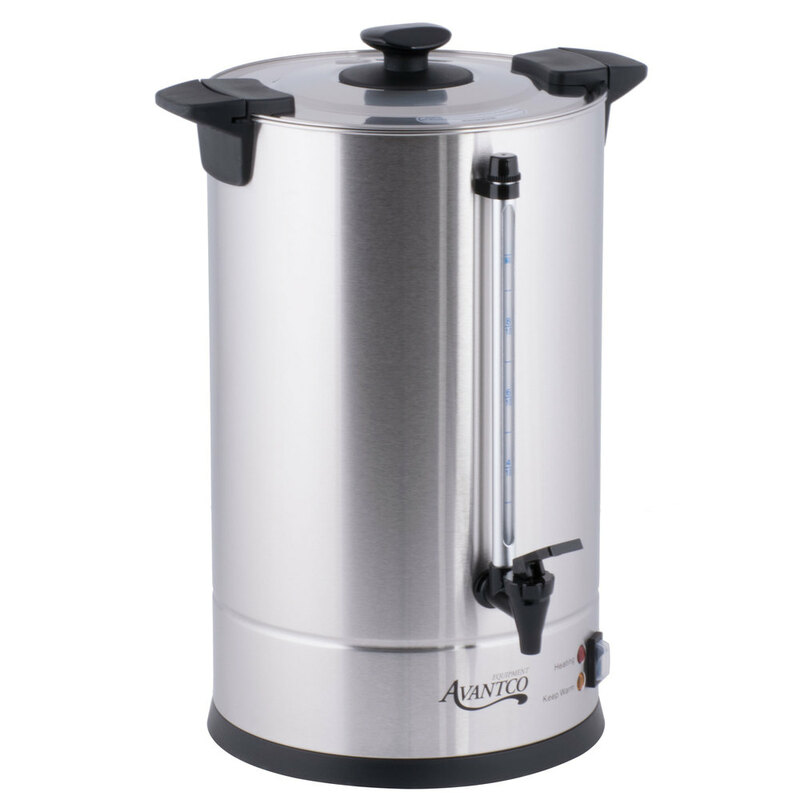 The Avantco 110 cup stainless steel coffee urn is a great quality product and makes a great dispenser for coffee or hot cocoa. The urn is easy to clean and keeps the coffee warm throughout our events. LOVE THIS! It looks a little sleeker than some of the more traditional percolators. The lids locks pretty tightly. We do a lot of off-site catering and we actually brew at the restaurant, wrap the percolator in plastic, and drop off hot at the client's event - with very little spillage. We have purchased several of these coffee makers. We use off-site on a continual basis. Very reliable for about a year of continual use. After that occasional problems. Still worth the money. We purchased 3 of these early this year and immediately they start to leak when the coffee is percolating. Leaks around the handles, down the sides then to the bottom where it collects. We thought it might have been the coffee grounds, which seem to be to course so that water doesn't seep fast enough to the bottom. We buy in bulk at Costco. Now the spout of one of the coffee pots has broken off and we need a replacement part. Our customer's love the ease of renting our coffee urns for their parties, weddings, or corporate events. We just recently used it at a Chamber of Commerce event. 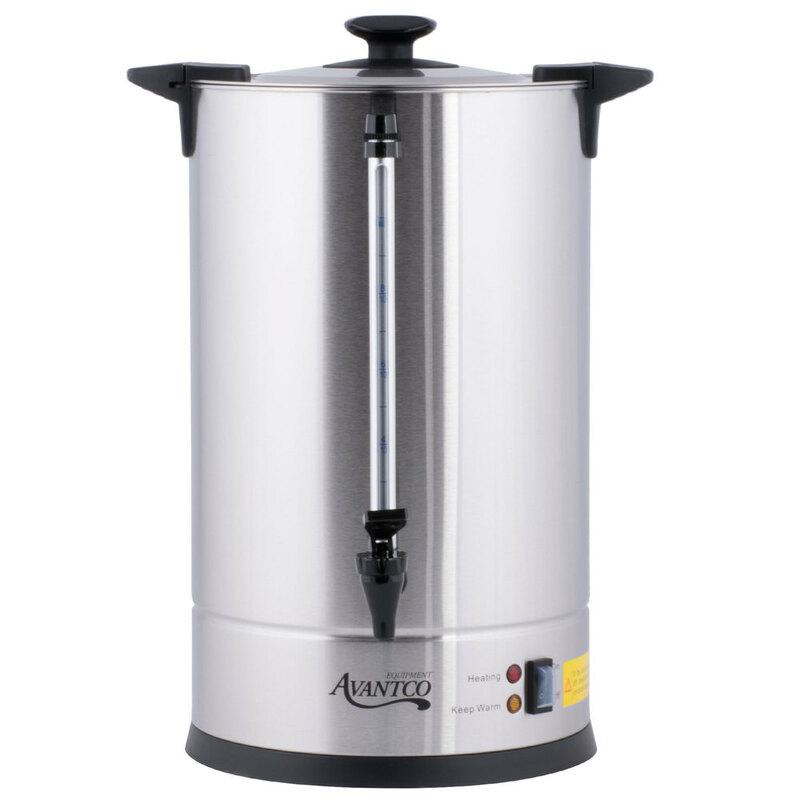 A very nice and large size coffee urn that is great for our company parties. They urn makes great coffee and keeps it warm throughout the evening. We are a Caterer and I purchased this urn for our parties. It is durable, easy to clean and easy to carry when its hot. I purchased this for use on buffets and have found it perfect for apple cider in the fall, hot cocoa in the winter, tea and coffee. It cleans easily and keeps the liquids very very hot. This was not my first pick but the site suggested it and I checked reviews on some other site which were pretty good. We used it for chai tea, it's a lot of work to make 80-100 cups of chai at dinner/lunch gatherings this is my secret helper that takes care of chai tea while I serve the meal. Love it. Revived this coffee urn as a gift. This small appliance works like a charm. Takes a little longer than excepted to brew, but worth the wait. I love this urn, i have used it at several events. It is perfect for all occasions and party size. Very easy to use and clean. After buying several alleged commercial coffee urns only to return them, these are keepers. I purchased two of them for our catering bakery business. They brew coffee quickly and even if left outside in cold temps, they keep contents inside perfectly warm while not being too hot to touch. LOVE them!! Love the shorter, squat shape to these urns--makes them sturdy, easy to peer into, and easy to clean. Also, the basket, stem and filter are very well made. We used this coffee urn for our Christmas parade, it help the temperature and was easy to assemble. We will be purchasing more in the future! Wonderful large 110 cup stainless coffee urn. Built to last, heavy construction. The price was great and it will serve our needs. Shipping was fast. This coffee maker makes the best coffee ever. The 110 cups are very good and tasty. I like the color of the stainless steel outside. Beautiful.